AFC Bournemouth under-18s moved into the fourth round of the FA Youth Cup after coming from behind to claim a 2-1 win over Mansfield Town. Noah Stokes scrambled home the opener for the Stags after his initial header had been saved, the away side ahead at half time under the lights at Vitality Stadium. But past the hour mark the hosts levelled as Jake Scrimshaw got a faint headed touch to Tom Hanfrey's wicked corner. 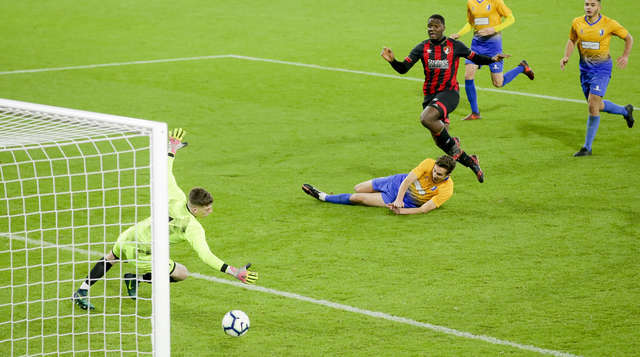 Pushing to the end and with Eddie Howe and members of the first-team coaching staff watching on from the stands, Christian Saydee's 90th-minute winner prevented extra time and sent the Cherries through to round four. Jack Cornell struck an early sighter not far off target for the away side, while Cherries striker Scrimshaw planted a header wide, the same Bournemouth man causing problems when he charged down the left flank and beat the 'keeper to the ball, the Stags' number one entering the book for his subsequent foul. However, it was the more physical visitors who grabbed the lead when a set piece was headed goalwards by Stokes. 'Keeper Calum Ward saved his effort well but couldn't hold on as Stokes followed up and managed to poke the ball home. Scrimshaw's fleet feet almost earned an instant equaliser for Bournemouth while visiting striker Jimmy Knowles was next set free, Ward managing to divert the shot onto the underside of the crossbar. The play moved to and fro ahead of the interval, Mansfield winning a number of free-kicks in dangerous areas while Scrimshaw beat the'keeper to a header late in the half only for the ball to fall to safety in the six-yard box. There was an added zip to the Cherries' play following the restart, Saydee pulling a low strike wide on the turn, Scrimshaw soon latching on to a bouncing through ball and half-volleying off target. Scrimshaw was the man to pull Bournemouth level, the striker rising well to flick home Hanfrey's inswinging corner and adding to his sizeable goal tally for the season. A fantastic move from the home side saw Jake Cope exchange passes on the edge of the area with Scrimshaw, Mansfield 'keeper Keaton Marrs down smartly to stop the shot, the Cherries beginning to dominate the tie. In search of a winner inside normal time, Scrimshaw broke into the box again his drive deflected over bravely by a diving defensive block. In the 90th minute the winner dramatically did come, Brennan Camp's forward run passed into Scrimshaw who in turn found Saydee, the striker's low effort into the far corner and sparking wild celebrations among his Bournemouth team-mates and the 241 fans braving the cold conditions. Progression eventually sealed, the Cherries will next face an away trip to Oxford United in round four, the tie to take place before January 19th with further details to follow.